What started with a bang followed by a massive down poor of rain which had Baker & Provan staff looking at each other and wondering if anyone would turn up. Fortunately the clouds dispersed at 5:05pm, the car park was full and we were off. Attendees networked for the next 20 minutes that followed. There was a positive vibe in the air and a general interest to see the Baker & Provan facility. Capability presentations by Baker & Provan, Precision Oxycut and Advanced Spiral Technology (AST) followed soon thereafter. It was great to see the passion from all 3 presenters talking about their companies. This passion was not lost on the audience as people were interested in what they presented. With the presentations over, people were separated into 4 groups. Each group went their separate way to tour the 6800sqm Baker & Provan facility. We were pleased with the interest in our capabilities. During the tour, another team setup the light meal to welcome the guests back from their tour. For the hour that followed networking resumed and cold drinks were consumed. Lucky door price giveaways follow (hampers with wine and Lindt chocolates). Baker & Provan were delighted with the level of positive engagement and the fact that everyone stayed until nights end, and yes some beyond. The feedback we receive on the night was fantastic saying that there should be more events such as these for our industry. We could not agree more. A strong relationship between Baker & Provan and My Gateway. A strong relationship between Baker & Provan and My Gateway. My Gateway apprentices play a pivotal role in the company’s continued success. Baler & Provan lathes in combination enables 20.9 meter turning capacity. Always looking to set Baker & Provan apart, our strategic acquisition of a Hwacheon Mega130 lathe does just that. This lathe provides Baker & Provan an additional CNC turning capability to 1,300mm diameter swing over the bed, 920mm cross slide and 6,500mm between centres. Used in combination with our existing capacity we can now handle lengths up to 20.9 meters and 1,388mm in diameter. Our turning capability, in turn supports our total service offering which includes deep hole drilling, fabrication, machining, assembly, test and site services which are detailed in our website bakerprovan.com.au. As the 2018 draws to a close, Baker & Provan wish to thank everyone for your continued support. Wishing you all a joyful festive season, safe travels and the best in the new year. Baker & Provan Awarded AS/NZS ISO3834 Certification. Baker & Provan made the Weld Australia NSW division news in September after being awarded AS/NZS ISO 3834 Part 2 Certification for meeting the Comprehensive quality requirements for fusion welding of metallic materials both in workshop and at field installation sites. It was a long and rewarding process for Baker & Provan, one which adds an additional layer to our quality system and in turn provides our customer with confidence. Congratulations Team! Luke Stanton-Mount Blitzes My Gateway's Apprentice of the Year! Baker & Provan wish to congratulate Luke Stanton-Mount for winning two My Gateway apprentice of the year awards. Luke walked away with both third year apprentice of the year and the overall My Gateway apprentice of the year. Luke was nominated by Baker & Provan's Management Team, for recognition of his enthusiasm, eye for detail and overall work ethic. Luke then had to undergo competitive assessment by My Gateway which included management interviews, assessments and review of references. The result of this process crystallised when he was both third year apprentice of the year and the overall My Gateway apprentice of the year in late November. For over 30 years My Gateway employs apprentices and trainees and places them with a host business to receive training in their chosen industry. 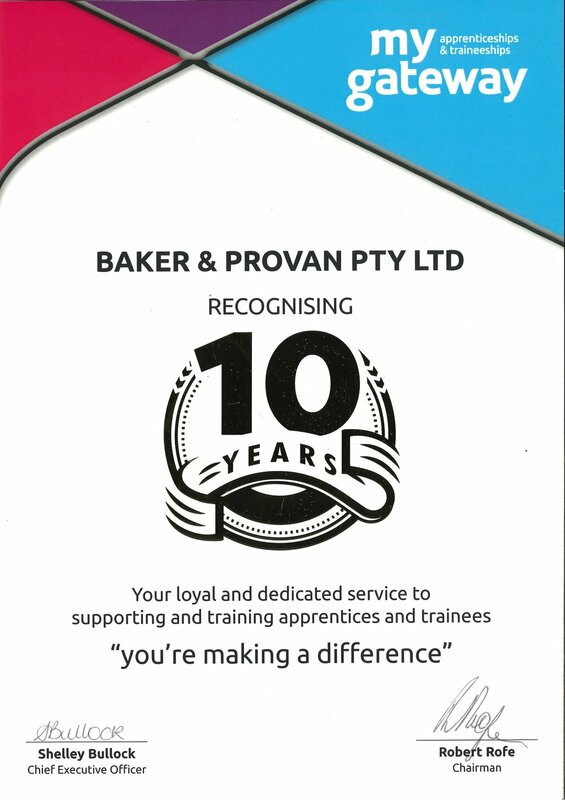 In Luke's case, Baker & Provan was the business which fulfilled the requirements for his career development. Earlier in the year, Luke competed and came third in the World Skills Regional Competition 2017. Since 1981 World Skills have been the leading voice for skills excellence in vocational, technological and service oriented careers in Australia. It has raised the awareness of hundreds of thousands of young Australians and their parents, industry and employers, that our nation’s future depends on effective skills training systems. Baker & Provan are delighted with Luke's achievements as he progresses to master his craft. At a recent My Gateway awards night, Baker & Provan were recognised for supporting and developing apprentices and trainees within our industry. Baker & Provan, being a fabrication and machining business, understands that our industry will not survive unless we continue to foster and support new apprentices. Whilst more and more of our work is going off shore, we believe that it's imperative as a nation that we continue to mentor, develop and grow our industry to ensure Australia retains this capability. We are extremely humbled to be recognised for this. Baker & Provan apprentice Luke Stanton-Mount competed in the World Skills Regional Competition 2017. Since 1981 World Skills have been the leading voice for skills excellence in vocational, technological and service oriented careers in Australia. It has raised the awareness of hundreds of thousands of young Australians and their parents, industry and employers, that our nation’s future depends on effective skills training systems. We are proud of Luke's achievements to date and look forward to watching him develop in his carrier. Baker & Provan were honoured to provide NSW Department of Industry Director of Defence - Peter Scott, a presentation of our defence manufacturing and service capability follow by a tour of our facility. During the visit, Peter provided insight into the NSW Government Defence and Industry Strategy. Baker & Provan General Manager – Bob Findlay welcomed Peter Scott’s visit and thanked him for providing time out of his busy schedule. Picture courtesy of NSW Department of Industry - Paul Clark, shows right to left: Peter Scott, Bob Findlay and Malcolm Cazier inspecting a functional and load test being conducted on a spare hoist assembly prior shipping to our customer. Baker & Provan welcomed the opportunity to host the Welding Technology Institute of Australia (WTIA) networking event on the 20th July 2017. Members were provided with a brief presentation on Baker & Provan's history and capability followed by a facility tour and refreshments. Baker & Provan wish to take this opportunity to thank WTIA employees and members for attending this event. We enjoyed networking with you all and look forward to future events. Today's business environment is ever changing. To be recognised, you need to stand out from the crowd. Responding to customer requirements as far as managing a projects scope, time, cost and quality is the key to delivery. But the challenge is, how do we engage with the community at large? At Baker & Provan we have analysed this very problem. Whilst we specialise in Heavy Engineering, Fabrication, Maintenance and Support within the Defence, Rail and Industry sectors, project managing our projects to meet our customer requirements. Historically, since 1946, our business has been based on performance, exceeding our customers needs from connections (word &/or mouth). Now, whilst maintaining our historic client base and our cultural performance ethos, we’ve made it easier, convenient and timely to connect with us. Today we (Baker & Provan) enter a new era. Today we are excited to announce that we have launched our new Website and Social media pages ( LinkedIn, Facebook and Twitter). The Baker & Provan's new website helps you stay informed of our achievements and developments through the New Feed page and connect with us through the Contact Us page. In addition, the social media platforms will provide an easy way to stay informed and engage with us. To this end, welcome to Baker & Provan, we are here to meet your Heavy Engineering, Fabrication, Maintenance and Support needs.